Tower had gracefully shaped cutouts in ends and sides. Clear panels in sides allow easy viewing of inside of tower. Ramp is fully carpeted and attaches easily into loft tower with no tools necessary. 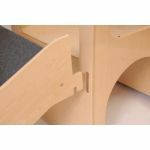 Play Center steps have red, antislip safety tape on each step and feature handle cutouts in sides Steps attach easily into tower with no tools required. Manufactured using 11-ply, all birch veneer panels with all edges rounded and sanded smooth. The non-toxic, environmentally safe UV finish resists scratches. 46"H x 75"W x 24"D. Weight 118 lbs. Additional shipping charges apply.